Here, just in time for the holidays we asked Johns to leak one of his favourites from the book, Lemon Dill Gravlax. 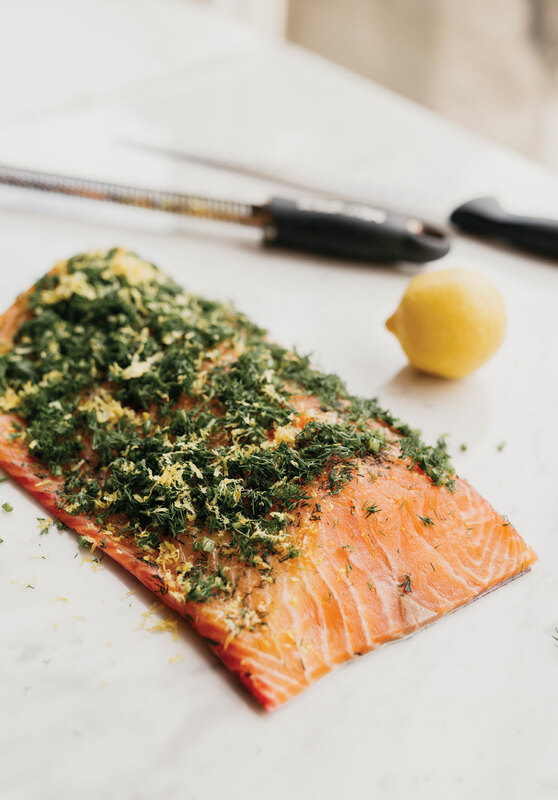 Curing salmon is so easy, but you need some time and patience. At a basic level, you can cure fish with salt and sugar. If you add some other ingredients like gin, lemon zest, maple syrup or grated beetroot, then the simple salmon quickly becomes the king of the sea. Smoked salmon is cured first and then usually cold- smoked after. Wolfhead is double-smoked and from New Brunswick and is the Queen’s favourite. So, if you ever meet her, as a good subject you can say that it’s your favourite too. Ask your fishmonger when their Atlantic salmon comes in and whether they can set some aside for you. You’ve got to start with a fresh and fatty product. In a large bowl, mix the salt and sugar together thoroughly to make your cure. Spread about a quarter of the mixture evenly in a large casserole dish. Lay the salmon skin-side down onto the cure. Sprinkle a small amount of the cure onto the flesh of the salmon and gently massage it in with your hands. Then garnish generously with half of the chopped dill and the zest of 2 of the lemons. Evenly sprinkle the aquavit or vodka over the salmon, then cover with the remaining cure. You need to make sure that you can’t see the fish anymore! Cover the dish with plastic wrap or aluminum foil. Find a nice flat place in your fridge and slide the casserole dish in. This will need to be refrigerated for 2 to 3 days, depending on how firm and salty you want your fish. Flip the salmon once daily and make sure that it’s always covered in the cure. Once the fish has firmed up to a texture that you like, rinse the cure off with water and dry with paper towel. Garnish with the remaining chopped dill and the zest of the last lemon and let dry, covered, in the fridge for another 12 hours.